Drainages in eastern Norton Sound include the Golsovia, Unalakleet, Egavik, Shaktoolik, Inglutalik, Ungalik, and Koyuk rivers. Of these, the Unalakleet River is the largest and most heavily utilized, by subsistence and sport fishermen. The village of Unalakleet is located at the mouth of this river. The Unalakleet River supports anadromous populations of Dolly Varden; king, coho, chum, and pink salmon; and resident populations of Dolly Varden, Arctic grayling, and whitefish. While the Unalakleet River is the only river in Norton Sound with a directed king salmon sport fishery, coho, chum, and pink salmon are found in good numbers almost everywhere. Typically king and chum salmon entire the Norton Sound rivers first (mid- to late- June), followed by pink salmon shortly thereafter. Coho salmon generally start entering freshwater in late-July and run through August. Dolly Varden can be found all times of the year but tend to peak in abundance around the same time as do the coho salmon. Many streams located along the southern half of the Seward Peninsula between Koyuk and Teller, including the Fish, Niukluk, Eldorado, Nome, Snake, Sinuk, Feather, Tisuk, Pilgrim, and Kuzitrin rivers, are accessible via the Nome road system and offer sport fishing opportunity for Arctic grayling, Dolly Varden, pink and coho salmon, and northern pike (northern pike are found in the Fish, Pilgrim, and Kuzitrin rivers). Small sockeye salmon runs have historically occurred in the Pilgrim and Sinuk rivers. King salmon are present in the Pilgrim, Niukluk, and Fish rivers in small numbers. Coho and chum salmon are more abundant in these rivers, particularly the Niukluk and Fish rivers. The state record Arctic grayling (5lbs 3oz) was caught and released from the Fish River drainage in 2008. Major drainages flowing into the Kotzebue Sound and Chukchi Sea include the Selawik, Kobuk, Noatak, Wulik, Kivalina, and Buckland rivers. Whitefish, Arctic grayling, Dolly Varden, lake trout, burbot, and northern pike are resident in the Noatak River drainage, while chum salmon are the only salmon species that return to the drainage in large numbers. These systems are known for their trophy size Dolly Varden. 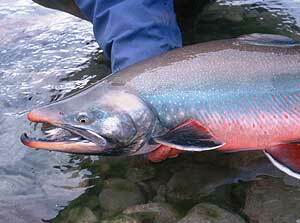 Chum salmon typically return to Kotzebue Sound rivers in mid-July and run through August. Dolly Varden can be caught from mid-July through September. 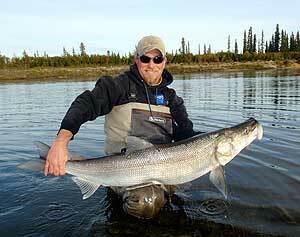 The Kobuk River contains the largest spawning population of sheefish in northwestern Alaska. Beginning with spring breakup, sheefish migrate over 300 miles to spawn in the upper reaches of the drainage. These large members of the whitefish family can be caught with large spoons in eddys and riffles in July near Kiana upstream to above Kobuk village in late August and September. The Alaska state record sheefish, (53 lbs), was taken in 1986 from the Upper Kobuk River. Dolly Varden, northern pike, Arctic grayling, burbot, lake trout, and Arctic char inhabit various parts of the Kobuk River watershed. The Selawik River also supports a spawning population of sheefish that shares rearing and winter feeding areas with the Kobuk River population. The Selawik River drainage and associated wetlands provide abundant habitat for whitefish and northern pike. The Wulik and Kivalina rivers drain into the Chukchi Sea near the village of Kivalina. These drainages provide rearing, spawning and winter habitat for diadromous Chukchi Sea Dolly Varden. The Alaska state record Dolly Varden (27 lbs 6 oz) was taken from the Wulik River in 2002.All five species of Pacific salmon, Arctic grayling, burbot, and whitefish occur in these relatively small drainages, however except for chum salmon in the Wulik River, most populations of these other species are small.